Bo Wade & Bert Ribul at "The Spot" from Scott Hagnas on Vimeo. 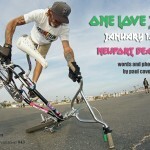 Scott Hagnas and Joe Loumena recently went down SoCal to enjoy the sun and hit up the One Love Jam. While there Scott filmed this video of Bo Wade and Bert Ribul session The Spot in Redondo Beach. This entry was posted in Video and tagged 2018, Bert Ribul, Bo Wade, CA, California, flatland, Joe Loumena, one love jam, Redondo Beach, scott hagnas, The Spot. Bookmark the permalink.